You can use any available, or not currently used, word or phrase as your blog domain name. You can make your domain name a company name, a nickname, or your favorite food group. For years, professional web designers and developers have been saying that all the good domains are gone, which is far from the truth. After all, new websites and blogs are launched all the time, and many of them have great, memorable domains! Even if a domain name is available, that doesn’t necessarily mean that it is safe to choose that name for your blog and purchase that domain. You should also check to see whether that blog name has already been registered as a trademark so that you can avoid accidentally infringing on someone else’s mark. You can search registered trademarks for free at www.uspto.gov. 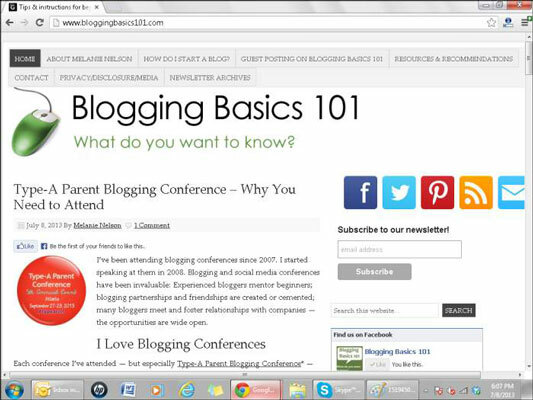 For an example of a great domain name, check out Melanie Nelson’s blog Blogging Basics 101, which provides new and seasoned bloggers with a plethora of blogging resources. Think up a phrase or sentence that says something about you and your blog as a starting place. Write your topic keywords on sticky notes and then move them around. That trick may lead to something great. Your readers can easily remember your site. Having a domain of your own looks professional; it’s a nice marketing benefit at a small cost. You can change web hosts or hosted blog solutions with impunity because your address is actually a separate service. If — or when — you move your blog, your web host can help you use the same domain to get to your new server on the web. If you’re having trouble coming up with a name idea, consider using your name. In fact, even if you ultimately want to use another domain for your blog address, owning the domain for your own name is a good idea. You can use several domain names to reach the same website or blog, too, so using your own name as a domain might help people find you in search engines. Many online tools can help you choose a domain name if you’re having trouble. 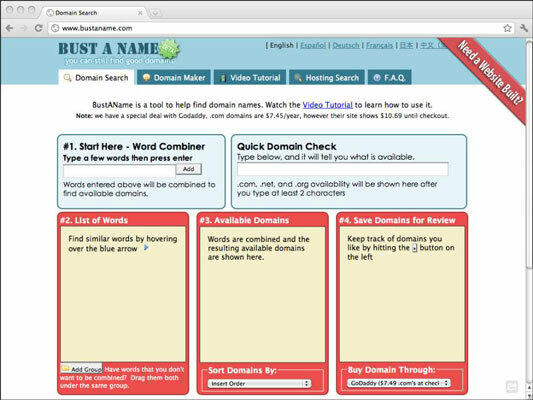 Domain-name-choosing websites help by suggesting word combinations and coming up with randomly generated choices. One good site to use for this purpose is Bust a Name. Even if you end up using a hosted blog solution and therefore don’t need to get web hosting, you can buy a domain and forward the address to your blog. This is handy to do because it makes your blog’s address easier to remember. After you register your domain, check the Help text of the registrar to find out how to forward the domain to your blog’s web address (URL). Instructions vary by registrar.